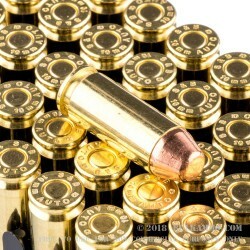 An outstanding choice for the 10mm shooter who wants to shoot and not break the bank! Sellier & Bellot is owned by the same corporate entity as Magtech which means shooters should expect to see the same quality of product. 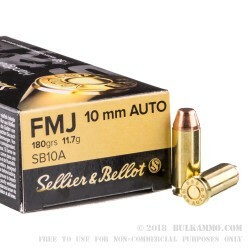 Sellier & Bellot is one of the oldest ammunition producers on the Market and holds themselves to a very high standard. 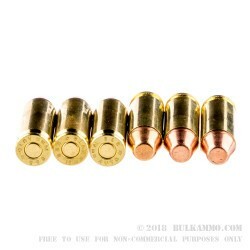 Their 180gr 10mm FMJ rounds are loaded with new factory brass and are considered a nice middle ground in terms of powder charge. The middle loading paired with the heavier projectile will offer shooter a true-to-life experience without the potential flinch that comes with hotter loads. The 180 grain FMJ is perfect for training, plinking, and recreational shooting. 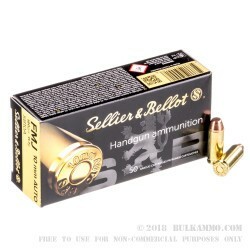 You'll get a single box of ammo with 50 rounds inside when you purchase this today but if you have a day of shooting planned, you might want to dive in with a handful of boxes.